The Cuisinart Electric Skillet has nonstick cooking surface which is ideal for low-fat or no-fat cooking with its extra-large 12- by 15-inch oval cooking surface. It includes a tempered glass cover with a stainless-steel rim and handle for easy monitoring of food while cooking. The electric skillet has die-cast stainless-steel handles flanking both ends provide a safe, secure grip. The temperature control dial with a handy indicator light adjusts from warm to 450 degrees F and can be removed to make the skillet dishwasher safe. The Electric Skillet has many exciting features for users of all types. You can extend the lifetime of your Electric Skillet with the purchase of a FactoryOutletStore Factory Protection Plan. 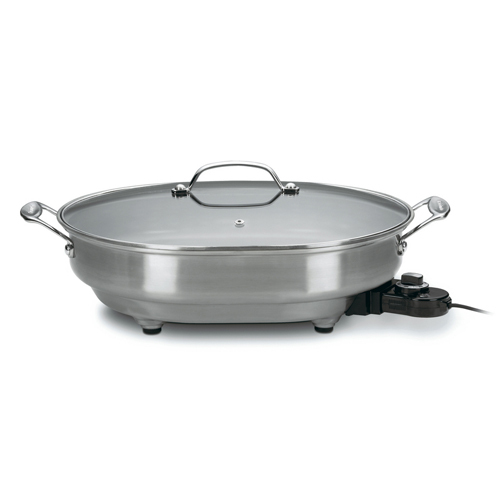 See the Electric Skillet gallery images above for more product views. The Electric Skillet is sold as a Brand New Unopened Item.